I was alarmed when I realized that this was a Ferengi episode. It turned out to be only minimally about the Ferengi, and better than I expected. Not great, mind you. But definitely watchable. Standard war games tend to consist of two factions with equal resources. I thought at first that this unequal contest (the best ship in the fleet versus a burned out hulk with a minimal crew) felt off, but there was actually an arc story reason: the Federation knows it isn't ready for an encounter with the Borg, so they were considering the very real possibility of an unequal contest to come. 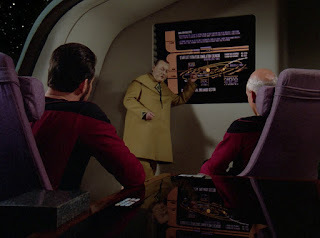 Even though the actual contest was cut short by the Ferengi barging in unexpectedly, the important points were that (1) brains, subterfuge and trickery may be the key to defeating a nearly undefeatable opponent, and (2) Picard strongly believes that Riker is quite possibly the best commander in Starfleet. Interesting that all of the war game planning appeared to be on Riker's side, like Picard thought a superior ship and greater resources would be enough. Or like he wanted Riker to win. The irritating guest star Kolrami was supposed to be a master strategist, there to help our heroes with complicated, um, strategy. And yet, Kolrami's supposedly massive skill set was effective only when it came to the game of chess Strategema. His solution to the Ferengi attack was to sacrifice the crew of the Hathaway and run away, as if real people were disposable chess pieces. He strongly disapproved of Riker's "jovial" style, as if being nasty and cruel was the only logical way to command. And yet, while Kolrami was certainly a tool, I thought Doctor Pulaski, in her continuing but failing efforts to make the Star Trek audience like her, acted inappropriately by pitting Data against him. Isn't it unprofessional and childish to ridicule an important guest in front of an audience? It's rare for me to not like a Data subplot, but I didn't much like this one. It made absolutely no sense for Data the walking computer to lose the game in the first place, or to need encouragement in order to regain his confidence. Bad writing, no biscuit. At any rate, the Strategema subplot was really just there to illustrate the "brain versus brawn" theme. Data was able to play Kolrami to a draw after looking at the contest in a different way. I also wondered if Riker chose to lose badly to Kolrami so that Kolrami would underestimate him, because that would be like Riker. Although this is not a great episode, there were several lovely character moments. My favorite (I laughed out loud not once, but twice) was when Riker dropped by to use reverse psychology on Worf, and interrupted Worf's messy work on the ship model. I also liked that Worf used his own knowledge of Enterprise's security against them, and that Wesley got into the trickster spirit and stole some antimatter. You just don't expect Wesley to cheat at anything. -- Stardate 42923.4. War games in the Braslota system. -- The four nacelles on the U.S.S. Hathaway just looked wrong. And the dilithium chamber on the Hathaway felt very much like a glorified microwave oven. -- Cheating in order to win was, of course, a major story line in the second Star Trek movie, The Wrath of Khan. -- The wonderful Armin Shimerman returned as yet another Ferengi character. He will become Quark the Ferengi, a Deep Space Nine cast member, further down the road. -- This episode also prominently featured a character named Ensign Burke, who never appears again. He was played by character actor Glenn Morshower, who had a long run on 24 and has appeared as a guest star in practically every show we've ever reviewed, including other characters in other incarnations of Star Trek. -- Kolrami was what the fans called a "face alien", a humanoid with facial make-up. His costume looked almost religious, except that it was yellow and decorated. Riker: "You're outmanned, you're outgunned, you're outequipped. What else have you got?" Worf: "I have wagered heavily in the ship's pool that you will get past the sixth plateau." Riker: "And if I don't?" Worf: "I will be... irritated." Geordi: "Sir, all of this is theoretical." Riker: "And if your theory fails to pay off?" Geordi: "Have you ever driven a Grenthemen water hopper?" Geordi: "Ever popped the clutch?" Riker: "You're saying we're going to stall the Hathaway?" Wesley: "And the Enterprise will waltz right over and pulverize us." Picard: "Less than one hour away from a battle simulation, and I have to go hand hold an android." Data: "Commander Riker will assume we have made this analysis, and knowing that we know his methods, he will alter them. But, knowing that we know that he knows that we know, he might choose to return to his usual pattern." It's Brent Spiner's delivery that makes this one so funny. Data: "If the warp engines fail to function, the result could be... unfortunate." Worf: "Very unfortunate. We will be dead." Pulaski: "Then you have beaten him." Data: "It is a matter of perspective, Doctor. In the strictest sense, I did not win." 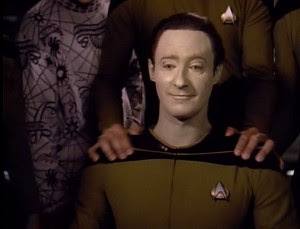 Data: "I busted him up." Thanks for reviewing this one, Billie! Like a lot of early TNG, it has some interesting ideas, but not always put together in the most compelling way. I did love Wesley cheating though, and Worf's developing a nice line in one-liners.